When one tastes a raft all kinds of rums from around the world and across the ages over an extended period, there is a normal tendency to look for stuff that’s a little different while still conforming to commonly-held notions of what a rum is. After all, how many times can one try a basic rum redolent of molasses, caramel, sugar, banana and maybe raisins and citrus without getting a little bored? Well, for sure there’s no shortage of new and interesting popskull coming on the market in the last few years, and I’m not just talking about the new agricoles, or the geriatric rarities released by the independents, but actual distillers and bottlers like Hampden, Worthy Park, Savanna…and that interesting outfit called Moscoso out of Haiti. Drink some of their klerens, and believe me, if you’re afflicted with ennui, this’ll cure what ails ya…if it don’t put you under the table first. Also called Barik (a creole word for “barrel”), Moscoso interested me enough to write a full profile of the company a few months back, and since that time they are aggressively seeking outlets and distribution in Europe, to say nothing of issuing all kinds of aged or unaged permutations of their booze. And my goodness, when you taste these things, the inescapable conclusion is they’re aren’t just rarin’ to take Barbancourt out back, kick the snot out of it and give ‘em a run for their money, but also casting narrowed snake’s eyes at the Velier-issued Vaval, Casimir and Sajous as if to say “Mwen nan bouda, nou zanmi”. Perhaps they have good reason. Their 55% Traditionnel 22 was a rum that stunned and smacked the unwary with all the force of a Louisville slugger to the face, and yet I felt it had been reasonably well made, with much of that elemental joyousness that so marked out the other, better known clairins like the Sajous that have so impressed me over the last few years. Which is not to say you wouldn’t be a little startled by the initial smells given off by this 55% white rhino. I mean, I nosed it and drew back with widened eyes, wondering if there wasn’t some excess Jamaican dunder or balsamo-infused cachaca in there — because aside from the brine and wax and glue and shoe polish, I was also getting a barrel of rotting bananas and funk, mixed up with musky, damp wood and wet dark earth (which I’m sure you’ll concede is not normal for a rum). It started out raw and fierce, and perhaps it needed some resting time, because after some minutes of letting it stand there (glowering sullenly around the room the whole time) additional aromas of freshly ground black pepper, cumin, masala, lemon peel and herbs became more prominent. “Meaty” is not a term used often in these pages, but here it was exactly right to describe what I was experiencing. 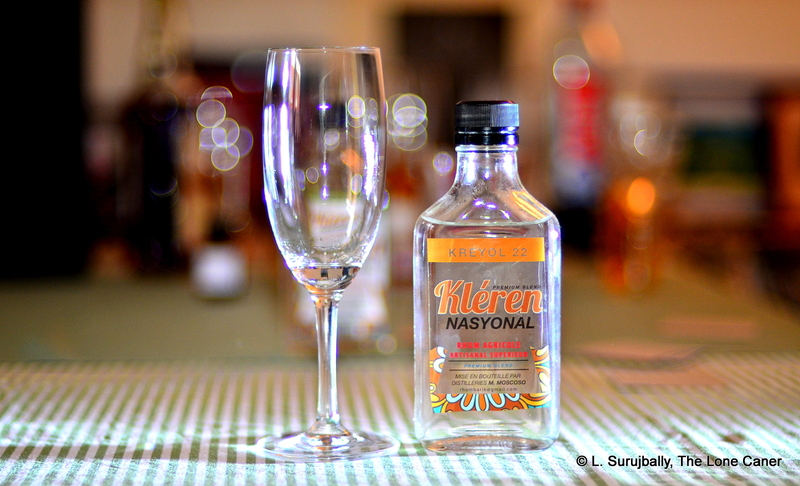 What elevated the rhum to something better than the nose suggested was the way it tasted. As seemed to be the case with all such Haitian whites I’ve tried, the nose was “da bomb” and the palate calmed itself down quite measurably, and a drop or two of water helped as well. Here the sugar water and watermelon came through much less aggressively, as well as brine and olives, fresh cane sap, nougat (!! ), some nuttiness and citrus (not much of that, a pinch not a handful), coming to an end with a long, somewhat dry finish which reminded me of sharp, damp sawdust of some freshly-sawn unnamed lumber in a sawmill (yeah, I worked in one once), as well as fresh grass, and sugar cane juice. So…quite an experience. Strong, distinct, flavourful, uncouth, odd, just on this side of bats**t crazy, and overall a pretty amazing drink – it would light up a cocktail with fireworks, I’m thinking. On balance the nose of the original Nasyonal earned my favour, but here the taste profile carried it ahead – it was a shade more complex, tastes better integrated. Whether you buy into that premise or not depends a lot, I feel, on where in the spectrum of rum appreciation you fall. I wouldn’t recommend it to a person now starting to branch out into white full proofs; and for those who prefer the softer, sweeter profiles of Diplomatico, Zacapa, Panamanians or dosed rums like El Dorado or Plantation, stay away. For everyone else? Oh yeah. Give it a try, if nothing else. And take a gander at what Mike Moscoso is making — because as he noted so elegantly up above, he’s coming for all of us. This rhum is not a true agricole, the label is an accidental misprint which (at the time) Mr. Moscoso was too poor to fix and reprint. It is made from raw brown sugar liquified to 12-14% brix with 7-12 days of fermentation (using baker’s yeast). Distilled on a 12-plate creole columnar still, final distillate coming out at 65-70% ABV and reduced to 55%. It is unaged and blended from the various returns of the distillation run. Points should be given to the company for issuing 200cl bottles for sale, aside from the standard full-size. For someone on a budget who wants a taste but isn’t sure, those things are a godsend. All clairins and klerens in my possession (six) were tried together, blind. By now, just about everyone in the rum world is aware of clairins, those indigenous crude white taste bombs out of Haiti, and once again, points have to be given to the farsightedness of Luca Gargano, who brought them to the attention of the wider world by promoting and distributing the Sajous, Vaval and the Casimir. Unfortunately, the acclaim these three have garnered have somewhat eclipsed any other clairins – and when supposedly some 500+ small outfits make the juice on the half-island, one can only imagine what else of interest is lurking there waiting to be discovered by anyone who loves crazy, speaks patois and has a 4×4. 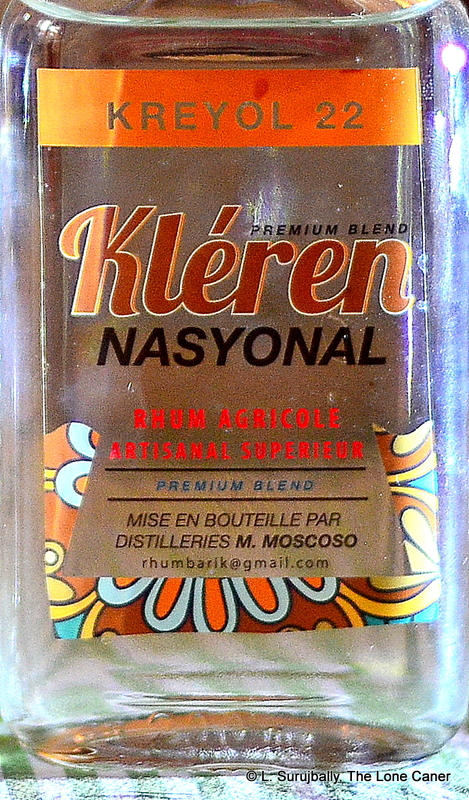 One that came across my radar not too long ago was the Kreyol Kléren series of rums made by a company called Mascoso Distillers, sometimes as Barik – a real company, not some garage-based pop-and-pup moonshinery making it with granny’s recipe for the relatives on the weekend jump-up. I ended up buying two of them and getting a sample of a third, which caused the customs officials in Frankfurt some real puzzlement as they had no clue what the hell this stuff was and required no end of paperwork from Michael (the owner) to prove that it was a rum, why the price was so low, how come they were all around 55% and no, they weren’t meant to be weaponized. You can understand their confusion (or trepidation). 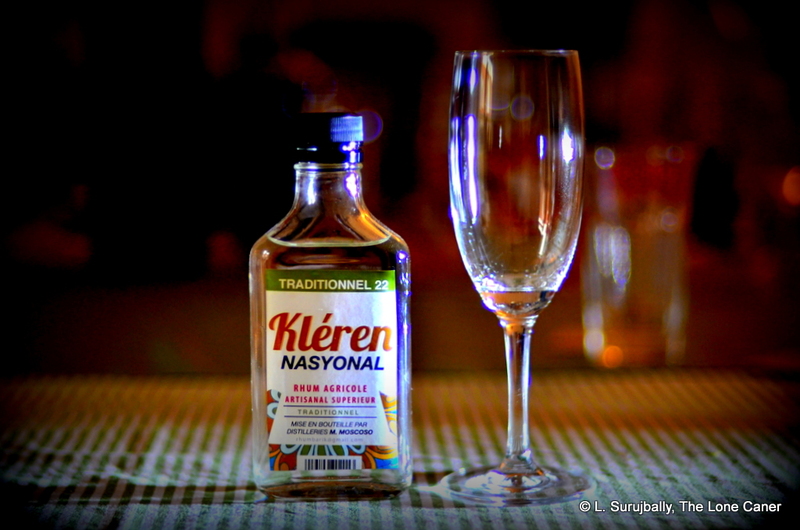 The Kléren Nasyonal Traditionnel 22 (a supposed “rhum agricole artisanal superior” based on the label, but not really, since the source is a sugar mash not sugar cane juice, and the label is a graphic design error) had an initial smell that was like inhaling a small fire-breathing sweet-toothed dragon. It was fierce, herbal and salty, and reminded me somewhat of that long-ago sonofabitch in the playground in second form who rabbit punched me in the schnozz without warning. I was using all three of the other (Velier-distributed) clairins for controls here, and what I sensed with the Nasyonal was their genesis taking form. It was not as cultured as the Vaval or the Casimir, and even the Sajous was somewhat more tamed (when was the last time you read that about those three? ), but in its very basic and elemental nature lay much of its attraction. It was rough and jagged and yet still joyously powerful, eventually giving up more leafy notes (basil, maybe), sugar cane sap, with much of the same salty wax and swank taste I remembered so well from the others. Thankfully the rhum settled itself down some when I was tasting it and now edged closer to the quality of my controls. Oh sure, it was still liquid sandpaper and not for the weak (or those preferring softer brown fare) – I would never try to convince you otherwise. Yet behind all that macho display of sweat and stink squirting from every pore was some pretty interesting stuff – sweet sugar water and herbal cane juice again, some gherkins in vinegar, and salt and olive oil and dill backing it all up. Phenomenal, long finish, by the way, making up some for the brutality of the preceding experience, suggesting salt and herbs and (again) cane juice. Not the most complex drink ever made, of course, and after taking it out back and beating my palate a time or three, it occurred to me to wonder, if Luca had smacked his label on it, would I have been able to tell the difference? (So I had the wife give me all four blind, and I was just able to pinpoint the Sajous and the Klerin but mixed up the Casimir and the Vaval – it was the edge on the first two that gave them away). Clairins may be made in every bottom-house, backhouse and outhouse on Haiti, where jury rigged creole stills are slapped together from mouldy leather jockstraps, old bata flip-flops and disused petrol cans (probably with duct tape). And yes, many of them are probably best left undiscovered, or relegated to those with noses, palates and livers more robust than mine. This one, the least of the three I’m going through, possesses enough points of distinction to merit a recommendation, so long as your tastes run in this direction. It’s a massive, Duke Nukem style hot shock to the system, displaying zero couth yet uncompromisingly boasting a uniqueness worthy of note. I can’t entirely or unreservedly praise the rhum, but it must be said, when I was trying it, I sure as hell wasn’t bored. I doubt you would be either, no matter how your experience turns out. The significance of the “22” lies in the proof point. Under the Cartier scale this translates into 55% ABV, while the more common Gay-Lussac scale equating to 55% / 110 proof is used everywhere else in the world. The scale here is a peculiarity of Haiti, as is the word “Traditionnel” which on Haiti means an agricole, not a molasses based rum. Straight from still to bottle, no ageing at all. Barik’s rhums are very affordable for those with an adventurous bent, and best of all, they’re sold in 200ml bottles as well. This is a conscious decision by Michael Moscoso, the owner, who understands that for it to sell even locally in a time of competition and adulterated Chinese crap trucked over the border, small bottles at affordable prices must be part of the sales strategy. Given how many full sized bottles I buy in a single year, I can’t help but applaud that. Barik has a fairly robust heritage. Founded by Michael “Didi” Moscoso’s grandfather way back in the early 1900s, it is now supposedly the fourth largest in Haiti, but plagued by infrastructure problems and those cheap ethanol derivatives. There’s a separate biography, here.